At the time of the 1871 census Frederick’s parents had been married only two weeks and were living in their own home at 6 Rewley Place: his father Thomas was aged 21 and a bricklayer’s labourer, and his mother Sarah was 20. Their first child Charles was born the following year, and Frederick, who was their second child, was born in New Osney towards the end of 1873. The 1881 census shows Frederick (7) as a schoolboy living at 3 Ayers Yard in the Hamel in St Thomas’s parish with his parents, his elder brother Charles (9), and his two younger siblings Lily (3), and Walter (1). On 3 November 1890 when he was 17, Charles was passed fit for service in the militia (3rd Battalion of the Royal Berkshire Regiment). His enrolment papers give a description of him: he was 5′ 5″ tall, weighed 107 lbs, had a chest measurement of 31.32″, and had a sallow complexion, hazel eyes, and brown hair. Rather oddly, given that he and his siblings had all been baptised at St Thomas's Church, his religious denomination is recorded as Wesleyan. At the time of the 1891 census Frederick (17) was still with his family at 3 Ayers Yard and was employed as a plumber’s labourer. His father Thomas (40) was still a bricklayer’s labourer; his mother Sarah (39) was now working as a washerwoman; and Lily (13), Walter (11), and Amy (6) were all still at school. 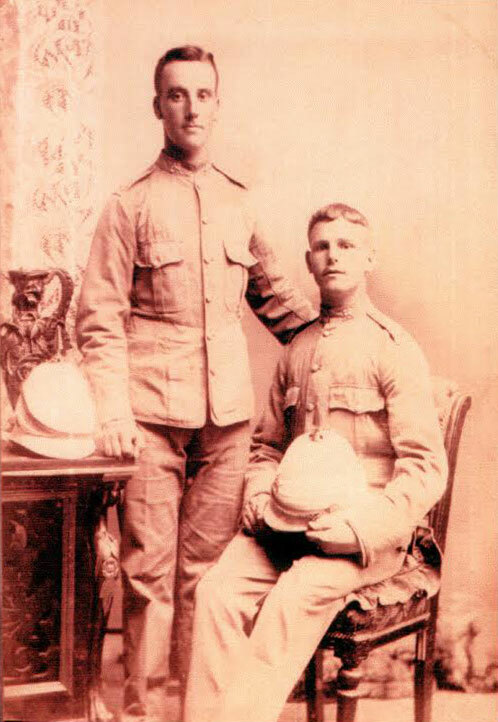 Frederick’s older brother Charles (18) had already signed up for the army and spent census night at Cowley Barracks. Frederick himself signed up with the army proper (again the Berkshire Regiment) on 8 June 1891 when he was 18 years and 7 months old. He had grown half an inch, and now weighed 119 lb. He had acquired a star and dot tattoo on his right forearm, and it was correctly recorded that he belonged to the Church of England. He served in the UK until 15 December 1893, and then in Bermuda until 1 December 1895. He was then in Halifax, Nova Scotia until 23 October 1897, in the West Indies to 18 November 1898, and in the UK until 1 December 1899. He then he fought in the South African War until 26 September 1902, being appointed Corporal on 16 November 1901 and Lance-Corporal on 5 September 1902. He served at home from 27 September 1902. His younger brother Walter had also joined the Royal Berkshire Regiment on 1 October 1897 when he was 18, and also served in South Africa. Frederick’s parents were still living at Ayer’s Yard on 10 July 1897 when his sister Lily (19) married Harry Wilkins (20) at St Thomas’s Church, but by 1901 they were living at 11 Hollybush Row, St Aldate’s with their youngest daughter Amy (16), who was a machinist in a ladies’ underclothing factory, and their grandson Harry Allsworth (3). (Harry was probably the illegitimate son of Frederick’s sister Lily, in which case she would have given birth to him when she was 16.) Frederick’s father (51) was now a brewer’s labourer. On 18 October 1902 at St Frideswide’s Church, Frederick Joseph ALLSWORTH (29) married the general servant Ellen Elizabeth THURSTON (26). Ellen was born in Somers Town, London in 1875 (reg. fourth quarter), the daughter of an LNWR porter who by 1901 lived at 2 East Street. Frederick was also described as being of 2 East Street on his marriage certificate, but was probably only lodging there prior to the wedding. Reginald John Allsworth (born at 4 Earl Street, Osney near the end of 1905 and baptised at St Frideswide’s Church on 12 November 1905). 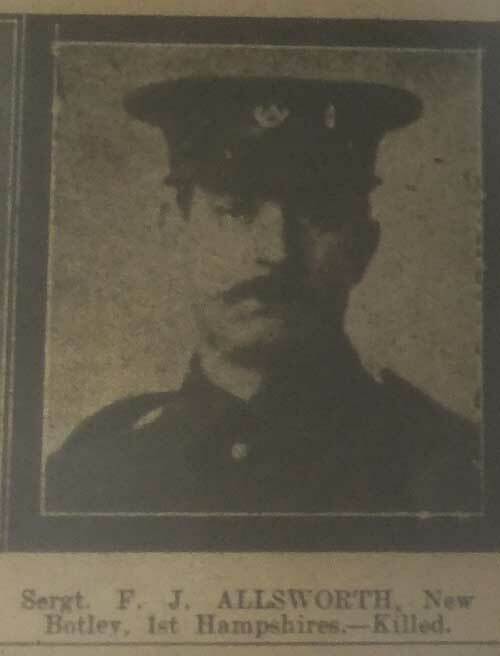 Frederick was discharged from the army on 7 June 1903, and then on 28 October re-enlisted into Section D of the Royal Berkshire Regiment for four years. He and Ellen were evidently still living with Ellen’s parents at 2 East Street when their first son was born, but had moved to their own home at 4 Earl Street by 1905. Meanwhile Frederick’s youngest sibling Amy Allsworth had three children while still unmarried at her parents’ home (11 Hollybush Row): Albert Edward Allsworth (born 1904/5 and baptised at St Frideswide's Church on 16 April, with father named as John); William Thomas Allsworth (born 5 February 1907 and baptised at St Thomas’s Church on 9 June 1907); and Florence Rose Allsworth (born in 1910 and baptised at St Thomas’s Church on 4 September). Frederick’s father died at 11 Hollybush Row at the age of 59 and was buried at St Thomas’s Church on 30 September 1908. At the time of the 1911 census Frederick Allsworth was working as a motor car washer in a garage, living at 4 Earl Street with his wife and two sons. Meanwhile his widowed mother Sarah (61) (who spelt her surname as Aldworth when she personally filled in her census form) was living at 11 Hollybush Row with her unmarried daughter Amy (27) who was working as a machinist; Amy’s three children Albert (6), William Thomas (4), and Florence Rose (under 1); and her other grandchild Harry (13), who was working as a printer’s machine boy. On Christmas Day that year Amy (27) married John Reginald Maizey (27) at St Thomas’s Church. In the First World War Frederick Joseph Allsworth served as a Sergeant in the 1st Battalion of the Hampshire Regiment “A” Company (Service No. 16387). He was killed in action in France at the age of 42 on 1 July 1916. He was buried in the Redan Ridge Cemetery No 2, Beaumont-Hamel, France (Grave Reference A.18). 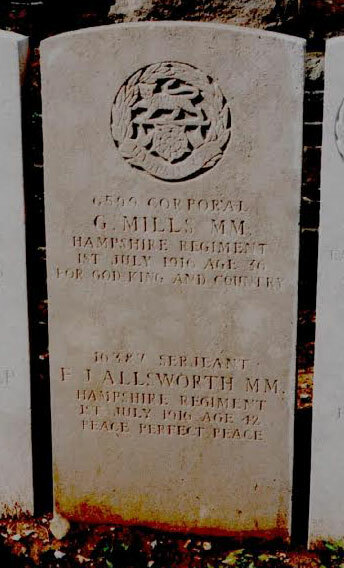 His mother would have had to pay for the additional inscription PEACE PERFECT PEACE on his headstone. He is also remembered on the war memorial board in St Thomas's Church, Oxford. Mrs Sarah ALLSWORTH died at the age of 65 at 11 Hollybush Row just a year after her son was killed, and her funeral was held at St Thomas’s Church on 27 July 1917. Mrs Ellen Elizabeth ALLSWORTH was still living at 4 Earl Street in 1936. She never remarried, and died at the age of 67 in 1943 (reg. third quarter in Abingdon district). Frederick J. T. ALLSWORTH (born 1903) married Dorothy M. CARTER in the Oxford registration district in the third quarter of 1931. They had two children: Jeanette M. Allsworth (born in Oxford in 1932) and Graham F. Allsworth (born in the Abingdon district in 1940). Reginald John ALLSWORTH (born 1905) married Stella V. CHAPMAN in the Headington registration district in the first quarter of 1931. He was living at 484 Campbell Road, Cowley by 1935, and at 19 Henry Road, Cowley by 1945.